Dana Scully: I had a visitor today, Mulder. The FBI wants your help finding a missing agent. Fox Mulder: I hope you told them to go screw themselves. Like many of my fellow X-Files fans, I have tried to expunge the convoluted misery of the series' final season or two from my memory bank, having watched more out of obligation than enjoyment. The fact that the show fell so far down the rabbit hole during its waning days was like watching a sick relative linger on longer than their dignity should have allowed. When it was finally over, it was more of a relief than anything else. It's been a long time since it all ended back in May of 2002, and I'll admit my curiosity was piqued when this 2008 feature film project was announced. Enjoyable as the characters were, it didn't seem the world (aka Internet geeks) was exactly clamoring for more truth-seeking Mulder and Scully, and cinematic history has proven time and time again that returning to the well does not always pay off. Picking up in relative real-time, years since the events of the series finale, I Want To Believe exists not as a big-budget action movie about UFOs and aliens, but instead like a long-form standalone from the good ol' days of The X-Files. This is not a muddy conspiracy/aliens storyline, and that was likely one of the reasons the theatrical release took so much heat from fans of the show. Yet on DVD, all of that downsizing of the confusing, excess plot baggage about an imminent invasion, black oil, and childhood abductions is pushed to the side in favor of something more self-contained, with an extremely dark story that carries with it a royally creepy plan by the film's villains. Yes, Mulder (David Duchovny) and Scully (Gillian Anderson) are living together in a cute little country farmhouse, though neither are with the FBI. He now spends his time tacking paranormal news articles on the wall, while she is a doctor who gets personally involved with her patients. A pair of kidnappings, severed limbs, an allegedly psychic priest (Billy Connolly), and a smattering of Mulder/Scully personal issues allow them to get drawn into the investigation by open-minded Special Agent Whitney (Amanda Peet) and her gruff, skeptical partner Drummy (Xzibit). Directed by series creator Chris Carter (who shares script co-writing credits with X-Files regular Frank Spotnitz), I Want To Believe dances that familiar and comfortable dance of having lengthy back-and-forths with the doubting Scully and believing Mulder, as the claims of Connolly's sexual predator Father Joe could either be genuine psychic visions, a regurgitation of what was on the news, or perhaps a more sinister involvement with the case. There's a definite tilt towards this whole thing being all about Scully, and that reinforces my longheld belief that the series itself wasn't really about Mulder looking for his alien-abducted sister while exposing an interplanetary conspiracy, but instead was about Scully, her struggles with faith and how it often contradicted her foundations of science and logic. Carter and Spotnitz, while sometimes avoiding a proper explanation of what has transpired since the show ended (the whereabouts of baby William get a vague mention about 30 minutes in), do keep this Scully-centric theme flowing here, and for some reason it pleased me greatly to have that kernel of character consistency. Those expecting big action set pieces and glitzy special-effects will be disappointed, as Carter wisely navigates through like this was just another series episode, and the look and texture of I Want To Believe has all the bumps and ridges of the show's glory days, with plenty of dark/nighttime shots, flashlights, and the driving force of Mark Snow's theme throughout. This plays like vintage one shot X-Files, albeit with somewhat more expansive production values that provide certain sequences�such as the opening police search across a vast, snowy landscape�a broader, more cinematic appearance. It gives us an opportunity to see where the characters went since the disappointing series finale, and Mulder's sarcastic banter and Scully's soul searching are once again a treat to experience. It is almost enough to make me forget the dreadful final season. Image Transfer Review: It's tough to accurately slap a grade on the image quality using the DVD-R screener that shipped from 20th Century Fox, but as far as screeners go I've seen worse. I can tell you the film (both versions) has been issued in 2.35:1 anamorphic widescreen, and the screener does a fairly solid job displaying details even during the dark/nighttime shots, of which there are plenty. Audio Transfer Review: The primary audio track is available in Dolby Digital 5.1 surround. This isn't one of those over-the-top showcase presentations, but the mix is remarkably subtle and moody, making good use of the rear channels and sub to create a nicely encompassing soundstage. Voice quality is clear at all times, and there are plenty of ambient cues to make nearly every sequence feel deceptively expansive. French and Spanish 2.0 surround dubs are also included. Extras Review: No complaints whatsoever when it comes to the supplements for this two-disc set, as 20th Century Fox has seen fit to outfit it with more than enough watchable content (the majority on Disc 2). Let's take a look. The main disc carries both the theatrical (01h:44m:24s) and extended (01h:48m:04s) versions, with the primary differences being a bit more gore/violence in the longer cut—stuff that didn't fit the PG-13 guidelines, apparently—as well as a couple of fairly significant character-driven moments. Each cut of the film is split into 24 chapters, and available with optional English or Spanish subs, though the extended cut does feature a different and much more enjoyable end credit sequence. A commentary track from creator/director/writer Chris Carter and writer/producer Frank Spotnitz is featured on both cuts, and while perhaps not the most dynamic presentation I've ever heard, it should be fairly satisfying for X-philes. They point out cameos by the numerous actors who appeared in the regular series (and there are a lot) and do their best to make discussion of locations, sets, and scene shots interesting while periodically elaborating on the evolution of the script over the years since the series ended. It's just a wee bit dry on the delivery side. Also included are three deleted scenes (05m:54s), one of which features an important moment between Father Joe and Scully that really should have appeared in the extended cut, if you ask me. Chris Carter: Statements On Green Production (06m:16s) is a strange one, and has the X-Files brainchild spending six minutes giving thanks to Ford for the use of hybrids, and how extensive recycling has become on set. Body Parts: Special Makeup Effects (08m:08s) features the terrific work of special makeup effects designer Bill Terazakis, and the tour he gives is almost like walking through a morgue. I'm normally opposed to Gag Reels (09m:48s), and while this one isn't necessarily an exception, it is moderately entertaining (though it certainly didn't need to be ten minutes long). Set to music from The Nutcracker, there's plenty of slipping on ice, cellphones going off when they shouldn't, props being knocked over, etc. A music video for Dying To Live by Xzibit (04m:04s) features stills from the film, and there are more in the Stills Galleries, broken down into categories entitled Collectibles, Storyboards, Concept Art, and Unit Photography. Disc 1 also includes both the domestic and international theatrical trailers, along with a preview of the remake of The Day The Earth Stood Still, a promo for the implied benefits of paying for a digital copy bonus disc, and the anti-tobacco "Bubbles" public service announcement. Here's where it gets really good, as Dsc 2 contains the sprawling Trust No One: Can The X-Files Remain A Secret? (01h:25m:55s) documentary, which is split into three approximately separate sections (You Can Home Again, Misinformation, Don't Give Up), viewable individually or via the Play All option. This sweeping and comprehensive look at the production features interviews with all key production personnel, behind-the-scenes footage, and, perhaps most curiously, the lengths Carter and company went to keep the plot specifics a secret prior to the film's release. Xcellent! The theatrical run for this one came and went rather quickly, and poor word-of-mouth seemed to kill it off pretty quickly. The reality is, I Want To Believe plays much better at home, as it seems like an extended standalone episode from "the good seasons" of The X-Files. This two-disc set carries the theatrical and extended cuts of the film, and a healthy block of watchable extras (including an in-depth 85-minute documentary). 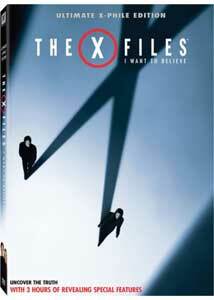 An easy recommendation for any and all X-Files fans.